Coco Fiber in Collection Pails/Compost Crock: Generally one must take the disc or brick of Coco Fiber and rehydrate and decompress it by placing in a container of water. Once the fiber has expanded its best to dry it out by leaving the fiber out on your porch or deck or at the very least in an open bucket in your kitchen. Coco fiber works best for collection pails when its its completely dried out. The reason for drying is that the coco fiber can then be added each time you add green matter to your composter and it will immediately absorb excess moisture to prevent odor and improper breakdown. If you store coco fiber in expanded dry form you will have the best results. Each time you add green matter to your collection pail or compost crock add a layer of coco fiber to completely cover the newly added green matter. You will notice less odor and pests in the collection pail. When you are ready to transfer your collection pail to a larger composter the material will already be premixed with green and brown matter. Hint: If coco fiber discs are used in the compressed form, it can be broken up by hand and added to the pail without having to decompress. You can even drop the whole disc in and it will eventually absorb the excess moisture and start to expand. Its simply a matter off convenience. 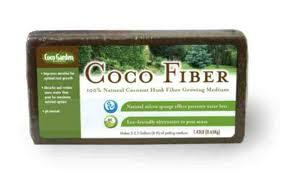 But a good rule of thumb is to maximize the benefits of the coco fiber by storing it in expanded dry form. Coco Fiber in Composters: It’s always best to expand the coco fiber and dry it out before use in the composters. But generally it’s ok to expand the coco fiber and add immediately to large composters because they tend to dry out faster (due to the higher temperatures) and the added moisture in coco fiber could be beneficial to the compost mix. A 1:3 ratio of coco fiber to green matter is a good rule of thumb but it really depends on the types of green matter being added. So the user needs to balance the mix based on his needs. Again how you use the coco fiber can depend on need and convenience so some may want to simply add a compressed brick or disc directly to the bin. The decision to decompress and dry out simply depends on whether the user has time or more importantly is whether they need an immediate effect. For example if their compost is starting to smell then dry expanded coco fiber will rapidly solve their odor issue. If the compost is well balanced and without significant odor then they can get away with adding the compressed form directly or even the expanded wet form immediately after expansion. Coco Fiber in NatureMill: In the NatureMilll an easy way to use the coco fiber is to break up a coco fiber disc and spread a layer over the top after adding green matter. We recently added a coco fiber pellet pack. If you are using the pellets you simply have to add 3 pellets for every 5 cups of green matter. The pellets are small enough so they wont jam the machine and will absorb moisture and expand on their own. Coco Fiber in Worm Bins: Decompress the coco fiber by soaking in water and then drain off excess water and place directly in the bin as a bedding for the worms. This entry was posted in COMPOSTING and tagged better compost, Coco Fiber, compost, compost pail additive, composter, COMPOSTING, crock additive, eco, energy efficiency, ENVIRONMENT, environmental, odors, sustainability, vermiculture, winter composting. Bookmark the permalink.